Russia and China in the Arctic: Is the US Facing an Icebreaker Gap? Among other things, Russia will introduce the design for a new super-nuclear icebreaker by the end of 2015. Last week, the White House announced its intention to accelerate the acquisition of new Coast Guard icebreakers amidst criticism that the United States is falling behind Russia and possibly even China in jockeying for advantageous positions in the strategically important and resource rich Arctic region. “[T]he Administration will propose to accelerate acquisition of a replacement heavy icebreaker to 2020 from 2022, begin planning for construction of additional icebreakers, and call on Congress to work with the Administration to provide sufficient resources to fund these critical investments,” according to a White House fact sheet. “These heavy icebreakers will ensure that the United States can meet our national interests, protect and manage our natural resources, and strengthen our international, state, local, and tribal relationships,” it continues. At the moment, the United States has only two operational icebreakers: the Polar Star and the Healy. 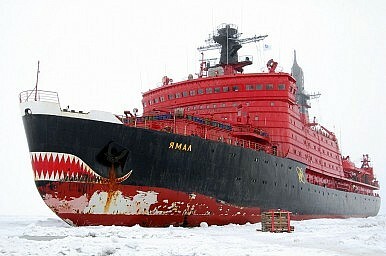 However, only the Polar Star is a heavy icebreaker capable of accessing all of the Arctic year-round. (The Polar Star’s sister ship, the Polar Sea, had a major engine breakdown in 2010 and has not been operational ever since.) Furthermore, the Polar Star, commissioned in 1976, is slated to reach the end of its operational lifespan in 2020. There are, however, various obstacles that need to be overcome if the White House wants to be serious about accelerating the construction of new icebreakers. First, it would need to find a way to circumvent the standard acquisition approach that would take the Coast Guard about ten years to build a new ship, according to retired Rear Admiral Jeffrey Garrett in an interview with Breaking Defense. Only then, Garrett elaborates, could a vessel be constructed within the next four years, assuming that the next administration will go along with the Obama White House’s new Arctic initiative, which is not a given. Second, the U.S. Coast Guard is facing severe budgetary constraints. The money ($1 billion) it would need to kick-start the development and construction of a new icebreaker is equivalent to the entire acquisitions budget of the Coast Guard for 2015, and it is highly unlikely that the service branch will receive additional funds in fiscal year 2016. Garrett, however, is adamant that new icebreakers are crucial to safeguarding U.S. national interests in the Arctic (e.g., ensuring freedom of the seas): “Yes, we’ve got lots of Air Force planes that can go over it and we’ve got subs that can sneak around under, but if you want to be there on the surface then you’ve got have an icebreaker,” he tells Breaking Defense. Meanwhile China — only a permanent observer in the Arctic Council and hardly an Arctic power — is expected to commission its second icebreaker by 2016, next to the one that is already operational, which according to Garrett is a “very capable vessel.” Interestingly, last week, five People’s Liberation Army Navy (PLAN) vessels were spotted in the Bering Sea, off the Aleutian Islands, where they allegedly entered U.S. territorial waters. As my colleague Ankit Panda pointed out, this move could have been influenced by “China’s growing interest in the sea lanes leading into the fast-thawing Arctic Ocean.” Also, China has recently expressed interested in deeper cooperation with Russia and acquiring Russian technology for building and operating icebreaker ships, according to Sputnik News. According to the White House fact sheet, Russia currently operates 40 icebreakers and has another 11 planned or under construction. Out of the 40 around 27 are ocean-going icebreakers, some of which are nuclear-powered. Russia is also planning to introduce a new class of super-nuclear icebreakers, by the end of 2020. According to Russian Deputy Defense Minister Dmitry Rogozin, the layout of the new vessel, purportedly capable of cutting through 13-feet-thick ice sheets, will be presented by the end of 2015. Unlike the Cold War missile gap, the icebreaker gap vis-à-vis China and Russia appears to be a reality. Will the US Coast Guard Close the ‘Icebreaker Gap’? The U.S. Coast Guard’s initiative to build additional icebreakers is gaining momentum.